Below are common attributes associated to Flirtation Orange Twinspur. Become a care taker for Flirtation Orange Twinspur! Below are member comments regarding how to plant Flirtation Orange Twinspur. No comments have been posted regarding how to plant Flirtation Orange Twinspur. Be the first! 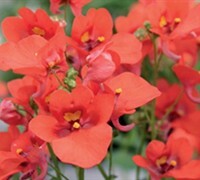 Do you know how to plant Flirtation Orange Twinspur? Below are member comments regarding how to prune Flirtation Orange Twinspur. No comments have been posted regarding how to prune Flirtation Orange Twinspur. Be the first! Do you know how to prune Flirtation Orange Twinspur? Below are member comments regarding how to fertilize Flirtation Orange Twinspur. No comments have been posted regarding how to fertilize Flirtation Orange Twinspur. Be the first! Do you know how to fertlize and water Flirtation Orange Twinspur? Below are member comments regarding how to deal with Flirtation Orange Twinspur's pests and problems. No comments have been posted regarding how to deal with Flirtation Orange Twinspur's pests and problems. Be the first! Do you know how to deal with pests and problems with Flirtation Orange Twinspur? Looking for Flirtation Orange Twinspur? Flirtation Orange Diascia will bloom through the summer in many locations, but if night temperatures stay in the upper 70s or higher they may flush out of flower. Dont worry, as soon as night temperatures drop they should resume blooming. While the plants are out of flowers grab a sharp pair of scissors or pruning shears and give the plants a light haircut. This will help tidy the plant and encourage additional branching which in turn will mean more flowers than ever when the plant begins to bloom again. In fact, anytime you think your Diascia might benefit from a trim, feel free. The plants will bounce back into flower quickly. Diseases don’t seem to be a major problem unless it’s an especially wet season. Snails and slugs are the biggest problem growing diascia. A ballanced time release fertilizer seems to work best. If you prefer to hand fertilize, don’t over do it or you’ll get leggy plants. Leggy plants can be pinched back, to keep them attractive and full. Although not hardy down to Zone 6, gardeners in Zones 6 - 8 may be able to over-winter plants with some mulch protection.